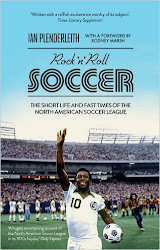 ROCK N ROLL SOCCER: Daily Express on RnR Soccer: "Hugely entertaining"
Daily Express on RnR Soccer: "Hugely entertaining"
I don't normally plug books here but the one I'm currently reading, called Rock'n'Roll Soccer by Ian Plenderleith, is a hugely entertaining account of the north American Soccer League in its 1970s heyday. Legends such as Pele, Franz Beckenbauer, George Best, Johan Cruyff and Eusebio played together every week as they tried to introduce the game to the US in a glorious but short-lived spectacular of sky-high salaries, showbiz hype and cheerleaders. The razzmatazz of clubs such as the new York Cosmos and tampa Bay Rowdies contrasted starkly with the grim grounds and hooligan taint of football here at the time, where a cup of Bovril was a luxury and I spent more than one Saturday afternoon dodging chunks of crumbling terracing lobbed by rival supporters over the wire fence of the partitioned Kop at my local club. The experiment might have fizzled out quickly and even today we don't treat the game there entirely seriously (a bit rich when you compare the USA's World Cup performances to England's). But you can trace today's Premier League pyrotechnics and the £350,000-perweek salary of Manchester United's latest signing Radamel Falcao back to it. Which, depending on how traditional you are, might or might not be regarded as a good thing.